The FLAMEX system can sense a spark or burning material in the ductwork upstream of the collection equipment and suppress it with a minimal amount of water in milliseconds before it can travel further downstream and become an ignition source for a fire or explosion. This simple and straightforward prevention approach minimizes or eliminates production interruption and can be implemented at a reasonable cost. 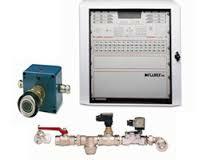 The flexibility of the system allows its use with various components and in various system protection designs.